The small provisional communities have been a very enriching experience, both for the communities that welcome them, the parishes, the places of solidarity and the young people who live this spiritual adventure. We are thus happy to continue this project in the immediate future. For this purpose, we invite all those who are interested to find out more during their next stay in Taizé. What is it about? Living together with a small group of young people, for a few weeks, in a neighbourhood or village to witness to the Gospel, while sharing the joys and the difficulties of the people living there. leading prayers and youth gatherings. 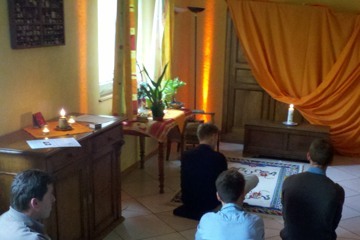 For more information contact: temp.com taize.fr.